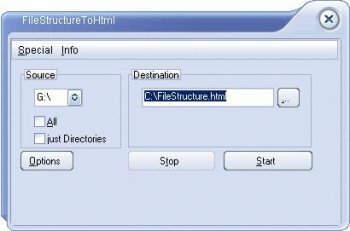 FileStructureToHTML literally creates an .html file of your selected drive or a specific directory. You can select the colors for the entire file, including the background, text, and links. The interface is skinnable. You can create a listing of songs, videos, or other items based on the extensions you enter. The files can be organized in a tree or in a table. Gain a whole new way of viewing your file list.